Metaparticles by Anthony Paul Perella... Electron Theory, Particle Physics, Origin of Matter. the composition of matter, taken from the literature of an ancient era when there was no "physics" to contrast with "metaphysics". Over a period of years we attempted to apply these clues, by trial and error, and later by computer simulations. Working specifically with the electron, new models of basic subatomic particles were produced. They could easily be tested and and shown to be congruent with examples of actual particle behavior recorded by experimental physics. More surprisingly, our models immediately solved behavioral mysteries that had persisted for decades. Thus metaparticle structure, though derived from a source beyond the strictly physical, is shown to apply empirically to the science of Particle Physics. Discussion: Divergent Balance; a new principle of particle structure or an undiscovered Natural Law? E-MAIL: mail@metaparticles.com COMPUTER CHARTS AND DIAGRAMS BY CHARLES BUEKER, SATELLITE DESIGN ENGINEER. THIS PRESENTATION IN DIGEST FORM INCLUDES UPDATES TO JAN. 1ST, 2003, WITH LINKS GIVEN TO HOME WEBSITE. The author herewith states that he is not affiliated with any organization, philosophical, religious, scientific, commercial, fraternal, or educational. The author wishes to say at the beginning that he possesses no scientific credentials, and claims no namable source of metaphysical inspiration or illumination. It was never thought initially that a simple new model of the electron, based on two points of energy rather than the conventional single point, would eventually be seen to have implications of such a widely inclusive nature. You are invited to reach your own conclusions as to the significance of such implications. Our attitude has been that when sound, repeatable evidence exists favoring certain alterations in basic scientific concepts, an account of the findings should be made public and offered freely to those interested. And when the discovery holds promise of explaining how all elementary particles are produced, the data should be put before those capable of carrying new outlooks forward in the science of particle physics. It seems reasonable that such professionals, including mathematicians, cosmologists and astrophysicists, might eventually give it attention, even though we cannot put such data in mathematical form. And we continue to think the potentials of metaparticle origin and structure will be found interesting and hopeful to others also, including nonprofessionals like ourselves. If you start with an imaginary premise, tailored to fit certain "clues" of uncertain origin, how can you reach the point of confidence that your electron model is not fictitious? The answer: Because both its forms, two- and three-dimensional, fit known facts of electron behavior. And further, our models fit those facts better than the one-point model science made do with for decades -- despite creating many "enigmas" over which only quantum mechanics could build satisfactory bridges. If an imaginary model works, it should no longer be thought fictitious. Especially not if supports the reality of the logical premise underlying it -- in this case a physically imperceptible "field" of dynamic energy whose laws dictated the eventual model. The process might be described as reciprocal evidence between causes and results. Let me end by stating that the Metaparticle Theory is based on a substantive aspect of that primordial field of energy, and not on the conscient aspect also associated with metaphysics. Consequently the theory does not depend on either mysticism or religion. Nothing about it in any way diminishes, disparages, or encroaches upon them, nor need it ever do so. We strongly hope and believe the concepts of metaparticle structure will only enhance both science and religion, each in it its own sphere of serving the needs of humanity. Unsolved scientific mysteries, particularly those relating to particle physics, provided the main impetus for the Metaparticle Theory from its beginning in ontological curiosity to the current state. It can now be presented as an organized series of inter-dependent arguments claiming, at its widest extent, that all matter originates in a substratum of undifferentiated energy underlying the universe -- non-objective, indefinable, but everlasting and ultimately real. We will be referring to this as the Dynamic Field. Subatomic particles are taken in this theory to be the original and irreducible state of matter having organized structure. Consequently, it must be strongly evidenced here that fundamental particles such as the electron possess a structure that can most logically be seen as deriving from the imponderable but omnipresent substratum, rather than from "nothingness", or the spatial vacuum, as thought earlier by physics. This is our Premise. Our evidence consists of showing, by means of computer simulations and comprehensible diagrams instead of by advanced mathematics, that many "mysteries of particle behavior", never solved through insufficient concepts based on wave/particle duality, are immediately solved by the two models of particle structure evolved and illustrated in this presentation. What Science labels as "mystical" or "metaphysical" is automatically deprived of relevance in a system built upon empirical results. However, metaparticle experiments do yield empirical results and are repeatable. This suggests, does it not, that although the substratum may not be "knowable" in the accepted sense of the word, it creates the knowable. Therefore we predict that as long as it may take, the "Field" of absolute energy which sustains existence will some day be found as necessary to physics as it is to metaphysics. Since the Dynamic Field or substratum is visible only in the forms of physical particles produced from it, and further since one of the two poles of every such particle is totally imperceptible except through its effects on the other pole, whoever wishes to call this a metaphysical theory is certainly justified in so doing. Just a few years ago popularized scientific books were filled with discoveries increasing the number and types of particles, plus highly interesting and imaginative wave theories -- the stranger the better, according to physicist Niels Bohr. Elementary particles were thought to consist of a single point-particle (or corpuscle) plus its "wave nature". Today it seems that behind the scenes as it were, the emphasis has shifted to more realistic particle structure, and relatively little is being publicized about probability waves, wave function collapse, et cetera. There is nothing to be served by mentioning here all the books and other sources from which data about physical particles were obtained. But it will become evident throughout this presentation that we have made very little use of mathematics. Charles Bueker is well educated in fields of math useful to a mechanical engineer whose specialties lie in the area of satellite design. But I myself am responsible for the theorizing and I am, to put it gently, "mathematically disadvantaged". Explanations of principles said to characterize the universal substratum are mostly metaphysical. They are essential to understanding metaparticles and must be given. But such explanations, even though I have labored to make them as clear as possible without overexplaining to readers, are difficult to condense. Consequently we give them in full in the section labeled DATA NOTES, hoping you will be interested enough in what the theory accomplishes to investigate them. * I summarize the major structural principles within the term Divergent Balance. The section following puts in seven consecutive steps the creation of an electron from the primordial dynamic energy of the substratum or Dynamic Field underlying space. 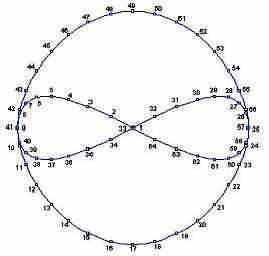 The sequential reasoning in the Seven Steps* is essential to the entire metaparticle enterprise. We are fortunate that no one has yet succeeded with arguments to invalidate the logic of their progression. These steps comply with what I can only call abbreviated hints concerning the constitution of matter. Such metaphysical fragments of what could once have been wider teachings may go back millennia. Dates are uncertain, but it is beyond question that they antecede the historical beginnings of thought about atoms. More detailed graphics depict the basic and augmented metaparticle models in the section following upon the Seven Steps. These include charts resulting from computer simulations. homogeneous motion whose dynamic energy remains in a single state of intensity. Laws intrinsic to the Field cause different but balanced points of energy to be instantaneously translated into objectivity. Thus unity of being becomes variety of existence. The substantive source of the creative process is an endless Field of homogeneous motion-energy, called here Dynamic Field. Natural Laws and forces should, by the principle of primordial non-duality, be coalescent with the Field. See Data Notes for explanations regarding homogeneity, dynamic intensity, and Existence vs Being. 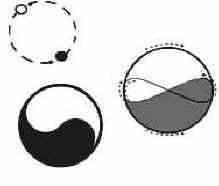 Separative vs unitive forces (divergent balance) is a hitherto unknown principle detailed in Discussions section of www.metaparticles.com (an external link). IN THE FIELD OF UNIFORM DYNAMIC ENERGY, A CHANGE OF INTENSITY IS CAUSED AT TWO POINTS. SEPARATIVE FORCE HOLDS THEM APART, BALANCED BY THE OMNIPRESENT UNITIVE FORCE SEEKING TO RESTORE FIELD HOMOGENEITY. Point a will become the visible "lesser"
pole and point b the invisible "greater"
pole of a fundamental particle. LAWS OF EQUILIBRIUM AND CONSERVATION DEMAND THAT THE CHANGING INTENSITIES TWO POINTS CAUSES ONE POINT TO HAVE MORE ENERGY, AND THE OTHER LESS ENERGY THAN THE BACKGROUND VALUE OF THE FIELD. THE SAME LAWS DECREE THAT ANY INTENSITY OF ENERGY ADDED TO ONE POINT BE SUBTRACTED FROM THE SECOND. The key factor in intensity as the only changeable element of the Field is explained in Data Notes under subhead of "The Primacy of Motion." Sequential steps are also misleading since they imply linear time. The first three steps are simultaneous; time enters only when the linked point-poles enter our spacetime. SINCE DIFFERENCES CANNOT REMAIN IN THE HOMOGENEOUS FIELD, BOTH "POINT-POLES" ARE TRANSLOCATED INTO THE SPATIAL UNIVERSE WHERE OBJECTS CAN EXIST. THEIR CONTINUING LINKAGE ALONG A LINE OF OPPOSING FORCES BECOMES A ONE-DIMENSIONAL OBJECT, WHICH IMMEDIATELY BEGINS ROTATING TO BECOME TWO-DIMENSIONAL. The two poles of a forming metaparticle do not become farther apart when translocating into universal space (as the diagram suggests). They have "diverged" only in intensities. THE DIVERGENCE OF POLAR ENERGIES TO INTENSITIES BELOW AND ABOVE THAT OF THE FIELD BACKGROUND IS THE CAUSE OF A CONTINUUM OF ENERGY RANGES THROUGHOUT THE COSMOS. THIS FACTOR IS RESPONSIBLE FOR THE PARTICLE'S POLE OF GREATER ENERGY TO BE INVISIBLE TO CONSCIOUSNESS FOCUSED AT OUR PHYSICAL LEVEL. The Metaparticle Theory relates to primordial principles acting in logically restricted ways to produce particle forms that can exist in a universe of relationships among objects and forces. To the extent that structure determines function, the theory is concerned also with the latter. THE OPPOSITE FORCES OPERATE AS A DIAMETER LINKING THE GREATER AND LESSER POLES. 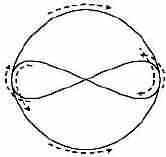 THE SEPARATIVE FORCE BECOMES RECOGNIZABLE AS ANGULAR MOMENTUM. THE COHESIVE FORCE, BEING INTERNAL, CANNOT BE ELECTROMAGNETIC. IT EXPRESSES THE PRIMORDIAL "UNITIVE" PRINCIPLE WHICH MAY BE AKIN TO THE EXTERNAL FORCE OF GRAVITY. Such details as the greater pole's invisibility, the "unitive" force compared to gravity, etc., are offered as hypotheses only. The invisibility of the greater point-pole of the metaparticle known as the electron is a fact, however, though explanations for the fact may differ. The essential principle of divergent balance is responsible for the greater pole's existence in a physically imperceptible range of energy. 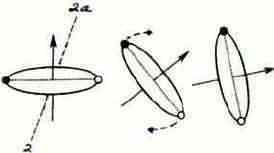 ROTATION OF THE POLES AROUND AN AXIS PERPENDICULAR TO THE DIAMETER CREATES THE DYNAMIC FORM OF A DISK. THE STRUCTURE NOW POSSESSES TWO DIMENSIONS. We contend that very fact is what led physics away from the truth of particle structure from the time the electron was discovered. In accordance with these 7 steps, the electron is indicated to be an example of a structural prototype originating in metaphysical reality. Note: Experiments have revealed satisfactory results when the velocities of primary to secondary axial rotations are in a ratio of one to one-half, or 2 to 1. * In the second edition of Metaparticles now on Web at www.metaparticles.com , Step 7 has been incorporated into Step 6. Note that a metaparticle is not a new type of particle, but a binary, bipolar structural principle discovered in physical particles. The electron, typical of particles having the archetypal structure shown here, normally travels through space in the Basic form of a dynamic disk as shown below (Fig.1 and Fig.2). As metaparticle moves along arrowline, objective point will trace out the “wave-form” of a helix. But that orientation disappears when the particle goes into double rotation in its spherical form* below (Fig.3). In the past, science’s structureless model of particles has required such explanations as “it is oriented in no direction,” or “in every direction.” The metaparticle’s alternating forms solve such paradoxes. In the past, science's structureless model of particles has required such explanations as "it is oriented in no direction", or "in every direction". The metaparticle's alternating forms solve such paradoxes. Dashline oval in Fig.3 shows another perimeter of sphere*, added for visual clarity. *Computer chartings actually indicate a spheroid. The movement of the objective pole of an electron (or similar particle) when it is involved in rotation on two axes is shown in Fig. 4. Arrows guide you through a very interesting and revealing pattern, in which the point-pole keeps to the surface of the spheroid form produced. Although rotation in particles is mentioned in recent publications for laymen, I've seen nothing about this form, which has been integral to the Metaparticle Theory since the early 80's. The spherical form of an electron develops simply from its rotating disk, which in turn comes from a diameter linking polar points of energy. The two point-poles are bound together by a primordial principle Science might one day wish to consider -- divergent balance. The computer rendition in Fig. 5 traces the pathway of an electron's objective point by enumeration. Having no hint of such structure, experimentalists have long had to abide with ever more ingenious wave theories that began to challenge the very conception of reality. But where intuition failed, the reliable predictions of Quantum Mechanics continued to provide what the work of science needed. Gradually, many scientists seemed to downplay understanding in favor of general utility. In recent instances, writers in the theoretical field are suggesting the idea that Quantum Mechanics might well be the actual controller of all universal laws and forces. (So I thought I had better start capitalizing it). front surface of dynamic sphere; No. 33 is on back surface. Comparison might suggest some connection. Did ancient sages somehow have knowledge of the basics of matter? Or is it just coincidence? There is very little doubt that certain foundational changes are being investigated, tested, and accepted among leading lights in Particle Physics. During the final years of the 20th century, veiled references began appearing in science articles and especially on the Internet, with a sort of controlled, scientific excitement glowing behind the veil. Momentous revelations are coming. "Soon". "Before long". Nobody says when. It may be that nobody yet knows exactly when. It's as though the Knights of the Round (or Discoid) Table cannot ride forth until they decide how to decorate their new horses. But all the inferences and official silences add up: Much indeed has to be revised, including the grand mystery of Wave/Particle Duality. For decades Physics thought fundamental particles were composed of a single point possessing mass, charge, spin, etc. But certain experiments showed particles also act like waves. Eventually came the compromise: An electron, for example, was thought of as being sometimes a corpuscle and at other times as a sort of indefinite “cloud of waves”— “probability waves” that “collapse” into a point particle when you attempt measurement. In Fig.7 that second point is shown as a white circle following the broken-line pathway. In the metaparticle it is diametrically opposite the known, physical point which carries the negative charge in an electron. They both rotate around an axis indicated by the arrow-line, which also represents the electron's direction of translation or travel. Note that each of the point-pathways describes a helix, so the entire particle translates through space as a double-helical "wave form". Fig. 7 as shown does not impress one as looking like a wave. 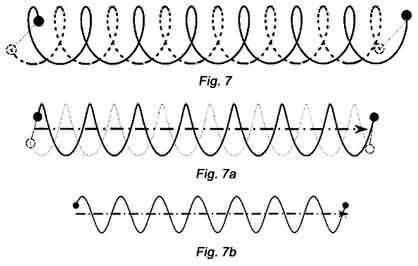 It does look more like the conventional idea of a wave when it is stretched out as in Fig.7a . But to get right to the cogent question that leads to solving the mystery of wave/particle duality, let's eliminate everything but the pathway of the black dot in Fig.7b. That represents the "wave track" made by the detectable point-pole of the electron (or lesser pole of the metaparticle-electron). The questions: After the black dot passes any given position reached along that black wave-line, the latter remains on the paper; but does it remain in space? Does that wave-line persist in actual existence -- as the dot does? If you say maybe it persists in the time aspect of spacetime, let me ask once more: Even if in some sense it exists in the past and is projected in the future, should the wave be granted a real existence equal to that of the particle? In my unprofessional opinion the answer has to be No. no reality, or you would have to say a bullet's trajectory or the orbit of the Earth around the sun is unreal. But though the point makes the wave, the wave does not make the point, so their "duality" does not give them equal reality. I do not subscribe to the idea that All Realities Are Created Equal, whether any historical celebrity ever said it or not. And in this particular case I would bet that Scientific Materialism does not fully believe it either. Let me now make this clearer than I already have: Particle Physics would have arrived at its changes and would be almost ready to announce its new Standard Model if the originator of the Metaparticle Theory had drowned in a rainstorm a year before he started work on it. Such has never been in question. The now and future question is this: How will scientists explain the way they are getting the "invisible" second point? Particle Physics is not, of course, quite yet ready to entertain the "greater pole", "more intensity", "Dynamic Field" explanation provided by metaparticles. But -- again in my opinion -- things would turn out a lot easier and better in the long run if they could. The point is real in energy and duration; the wave has a subsidiary reality as the space-time track, past and future, of the point. But since the point-particle is always in rotation, creating the wave, both co-exist simultaneously and are both significant. The most momentous example of a major particle mystery solved by metaparticle structure in basic, 2-D form was given in the Wave/Particle Duality section. Others could be mentioned in instances where the electron (representing a class of particles) is in orbit around a nucleus. 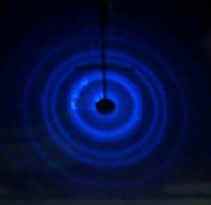 But I have decided it might contribute more to our credit account in your mind if we outline a major, perennial, complex mystery that has tested the imagination of many a well-known particle physicist: the electron beam diffraction experiment. You'll see why this one is easier to visualize than it is to diagram for a computer screen. Imagine a tube, representing an electron gun, projecting a beam of individual electrons. They must go through a tiny hole in a barrier to register as small dots of light on a phosphor screen. The electrons hitting the screen straight-on build up a bullseye in its center. But the rest of them make concentric rings around the bullseye, exactly like a target. What could be causing this rather startling phenomenon? That is what so many theoretical physicists were straining their imaginations over for generations. They came up with one marvel after another, many seemingly preposterous but impossible to prove either right or wrong. As far back as 1985 books show that physics was applying the hypothesis of side-wise momentum to this problem (implying particles), yet at the same time declaring it was a wave interference phenomenon. No one seemed to know what might be causing the sidewise momentum. We are of course convinced that the helical pathway of the basic metaparticle-electron will explain sidewise momentum and provide the final answer to this challenging puzzle. We have neither the equipment nor the mathematics to attempt a computer simulation ourselves. It would take an experimental lab. But here is what I wager -- figuratively speaking. I'll bet Particle Physics already has the answer by now (1/03), and it is keyed to a new binary or two-point structure of fundamental particles. Repulsion between the negatively charged electrons in atoms of the barrier hole edge and the "lesser pole" of the incoming electron is responsible for the target pattern. Electrons in the gun's beam are deflected at various angles to strike the phosphor screen, building up the concentric rings. Remember, there is no way we could know where Science stands, at the present moment, on the electron diffraction mystery. Yet I am so sure this problem can be satisfactorily solved only by the basic metaparticle structure that I am willing to gamble my (figurative) reputation on it! Puzzling observations regarding the orientation or "spin vector" of particles began cropping up before the middle of the last century. Even then there was uncertainty about whether particles were spinning or rotating, and some theorists implied both, but without explaining how or why, as far as I could tell. But it seemed generally accepted (by science writers, at least) that an electron could be imagined as "spinning" around an axis, either clockwise or counter. Which way determined its spin vector. The upshot that concerns us here is that when Experimenter A measured the orientation of a particle, he reported it had definite spin vector, up or down. Meanwhile Experimenter B has been measuring another electron with identical equipment and conditions, and she reports hers shows no orientation in any direction. Or perhaps, she adds, it is oriented "in every direction". Even for an alert browser reading this sort of thing, the word mystery tends to come to mind. Stephen Hawking seemingly confirmed the mystery in A Brief History of Time (1988), when he wrote that quantum mechanics contradicts the picture of particles as tiny tops spinning around an axis by indicating that spinning particles display no distinct axis. The two metaparticle forms account for a distinct answer, however. One sees immediately in the basic model (Fig. 8) that rotation around an axis by two points (one of them invisible) accounts for up or down spin vector. But to explain Experimenter B's strange case of either no-which-way or every-which-way, the basic model has to take on secondary rotation or gyroscopic precession, becoming a dynamic sphere. as I sometimes do, that particles are extremely small objects. Scientific techniques keep improving, so I should only say I think they still can't tell whether the particle they constrain for experiment is being held static in an oriented or disoriented condition. Not until they probe it by some means such as x-rays, photons, etc. But when Experimenter B can't find any vector in her captive electron, we contend the doubly-rotating, spherical, metaparticle model is responsible. The rapid rollover of the metaparticle disk to make the spherical form is indicated in Figs. 8 and 9. For diagram purposes it shows the particle as though moving left to right; but in the grip of the magnetic field the particle will "rollover" in place. Precession* causes the basic disk to begin rotating on secondary axis 2 - 2a, while its two poles continue their revolution around the arrow axis. This results in a constantly changing spin vector and explains why Experimenter B's electron has become "disoriented". * Brookhaven National Laboratory announced in 2001 that precession had been observed in the spin of a muon (heavier electron)'. They intimated such discovery might challenge the Standard Model of particle physics. I have as yet encountered nothing else relating to a particle's ability to assume spherical form, which has been a major aspect of metaparticle structure since the late seventies. Stephen Hawking remarks the fact (in A Brief History of Time) that particles of spin-½, such as the electron, do not look the same if you turn or roll them over through one complete revolution; you must put them through another 360°. We thought we had this puzzle solved ten years ago. We wondered why nobody applauded. Well, I had it wrong. With your device you cause the electron to "roll over in place". (You can't watch it do this, of course.) You stop the process after one complete rollover, do your measuring, and find the electron is now upside down. You are puzzled; it should be right-side-up again. Undaunted, you repeat the rollover another 360°. Amazing; the electron now shows the proper up-vector again. You report this and change your field of research. The answer to this mystery lies in the ratio between the first rotation (poles spin to create a dynamic disk around the primary axis) and the secondary rotation, known in this case as gyroscopic precession. 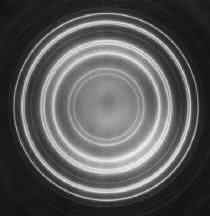 The disk itself revolves at a slower rate of velocity to make a dynamic sphere. The ratio between the first and second rotations is 1 to ½ or 2 to 1. At that particular ratio the electron rolls over and comes around right-side-up at 360 degrees. All along the secret was this: The electron changes from basic to spherical form when forced to roll around in a clock-like circle. All would be well except for the theoretical fact that the magnetic field device slows down the velocity of the secondary rotation, so it is no longer in the ratio of 1-to-2 with the inter-polar primary rotation. The ratio changes to 1-to-4. Following the black (visible) pole you can see it makes two complete revolutions around the inter-polar axis. That is 720°. But primary rotation of the poles is not what determines the up-or-down orientation of the particle. The turning over of the disk does that. The slowly tilting arrows show the disk has turned only 90° -- and is upside down -- even though the experimenter's device shows 360°. Now the likelihood is very great that this mystery is solved by the influence of the rollover device on the metaparticle's secondary rate of rotation. But we are not claiming a complete solution yet on a technicality: We can't get a particle physicist of the experimental mode to tell us what we need to know about that magnetic field "device". Does it not have to turn over itself in order to turn over the electron? Maybe we will never know. "Metaphysicists" are not popular with Physicists. And that's a problem (not a mystery) we can't solve. PS - The Fig. 10 sequence only takes you half-way. Should you desire a fuller exposition, and are willing to risk inter- polar vertigo, click on the "Double Rotation" topic at our home website: www.metaparticles.com . They say every Parisian could recognize Napoleon's horse. Its exercise groom would often water it at a certain trough on the Boulevard Saint-Germain. A street artist whose setup was on a nearby bridge did an ink sketch of the horse at the trough one day. He hung the sketch from his umbrella on the bridge and sold dozens just like it. Eventually "the Emperor's horse" became a sort of local landmark. A few years later the famous artist Delacroix was passing along the Boulevard Saint-Germain and saw Napoleon's horse drinking at the trough. From quick sketches done on several such occasions he eventually did a large oil painting which was displayed in the Louvre. Is it a mystery that art-wise Parisians never referred to this instance of similarity as being a coincidence? After all, they would say, "it is the same horse." The analogy is imaginary but applies, as I think you may agree, to instances of similarity evident in the two lists of structural foundations below. One concerns metaparticles and the other is a best-guess list of particle features that I think are likely to show up in the new Standard Model of Particle Physics. I am predicting that two or three features will be very similar between the two listings, though others will probably not be. Of course, if there are no similarities at all, there goes the metaparticle's chance of earning a footnote in the history of science. 1 - The basic reality of a Dynamic Field underlying all existence. 1 - If an ultimate origin of particles will now be theorized, it may call upon concepts such as the "quantum vacuum" as energy source, but surely not the Dynamic Field of substantive metaphysics. 2 - A principle now called divergent balance, first described in 1983. It keeps the poles of a particle both together and apart, dividing their energies in a metaphysically balanced way that assures stability. 2 - Known or previously theorized forces will be postulated to maintain particle structure, but certainly not the metaphysical principle of divergent balance. 3 - The resulting bipolar structure of particles in the electron category, and probably also particles similar to those in certain ways. 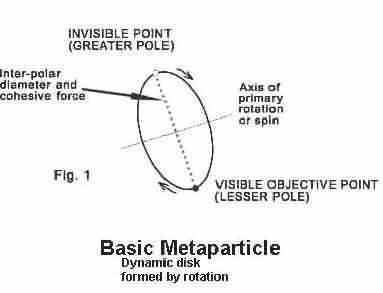 The presence of diameter in metaparticles permits internal rotation to replace the former concept of a spinning point. 3 - At least two points or nodes of energy will be found indispensable for internal rotation, perhaps a binary or bipolar structure, perhaps another physical possibility; but in the electron one node will have to be the negatively charged point. 4 - The necessity for one pole of a metaparticle (which I call the second or "greater" pole) to be physically imperceptible, except by inferred influences. 4 - A second node of energy in stable association with the visible or perceptible node will have to be physically imperceptible - otherwise it would have been discovered a century ago. 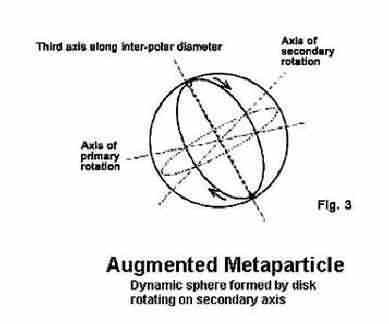 5 - The ability of a basic, two-dimensional metaparticle to assume spherical or spheroid form; it does this by taking on precessional rotation on a second axis. (Precession is a known gyroscopic phenomenon discovered to apply at the particle level quite recently, but incorporated in structural metaparticle models in 1983.) . 5 - Alternate 3-dimensional form employing the physical principle of gyroscopic precession. Having finally gotten all that into visibility, I will now take the leap and commit the Metaparticle Theory to the prediction that Numbers 3 and 4 (definitely) plus No. 5 (very probably) are the particle features in both lists that will prove to be essentially the same or quite similar. I will also volunteer to admit that in these three cases, Metaparticles has a predictive advantage by having been first to start down this road. What is important and what just "has significance"? When Physics adopts new particle models you can depend on it that those models will do the work Particle Physics demands. Importance is awarded either by great numbers of people or by smaller numbers of very influential people. In this case both can be counted on. From such a viewpoint the Metaparticle Theory will probably be seen as important only to the extent it is congruous with the prevailing new models. But if Metaparticles can continue on the sidelines as an alternate approach to understanding certain aspects of universal existence, then its basic principles will retain significance. In this case that means promise for the future of science; promise for the expansion of understanding. Metaparticle solutions to mysteries is a small thing compared to the significance of its originative principles. In the field of scientific inquiry and in the future tense, these could hardly be more significant. One naturally wishes to know exactly why. My answer has to be this: Because the metaparticle origin of nature's fundamental building blocks offers, for the first time since Particle Physics became a science, a provable linkage between empirical physics and substantive metaphysics. Which sounds very impressive. But it will mean little until science begins to use that linkage. And in my opinion science will not pick up something unless it is wearing its own gloves. A dozen years ago, scientific interest in the mystery of quintessence or dark matter had scarcely begun. Today considerable progress has been made relating to the problem of "the expanding universe". But we out here in our relative ignorance have been getting overstuffed with the negatives and underfed with positives. There has been a spate of featured articles in news and science magazines on this subject. Ever enamored of the sensational, writers have chosen the most negative possibilities, treating them as though they were certainties. They have displayed a sort of depressing enthusiasm in depicting a distant future in which no whisper of life remains, no stars, no light, only the scattered dust of galaxies in unending darkness. But there are now specialists in cosmology, astrophysics, and astronomy who are interested deeply in a brighter picture. They are looking for and turning up promising leads toward finding more matter, new sources of energy and gravitation to offset galaxies speeding away from each other as though seeking solitude. SUBSTANTIVE ASPECT: Concerned only with the permanent substratum of dynamic "substance" underlying objective existence and sustaining all ranges of its matter and energy. CONSCIENT ASPECT: A correlated and equally basic realm within (and in a sense beyond) the universal substratum, comprising consciousness and the conscious entities of religions and various worldviews. In a minimum of words, it is the substantive aspect of metaphysics which holds future promise as an expanded and entirely proper domain for scientific progress. Hypotheses and theories concerning "quantum vacuum energy" in space, new implications of the zero concept, and the granting of a sort of "lesser reality" to virtual particles -- these and other important lines of inquiry are now underway. They tend to imply a future in which perhaps the greatest cosmic mysteries will be put in retreat. Such a future will, I dare to predict, have need of an expanded conceptual framework by which science can more effectively deal with higher ranges of matter/energy. Every man who continues to call himself a philosopher, regardless of what others may choose to call him, should allow himself at least one high-sounding aphorism. particles join together essence and existence. Pending additions here, information on the divergent balance principle may be found in Discussions I, www.metaparticles.com . Our e-mail address is mail@metaparticles.com . The Premise of a theory employing deductive reasoning is taken as being axiomatic as the source of postulates derived from it. In this case the Premise can be stated only as a composite of related metaphysical concepts, which depend on their physical applications for worldly credibility. In Western metaphysics can be found a wealth of studies devoted to the nature of being, and seeking definition of an underlying, basic substance. Ontological inquiry began with ancient Greeks such as Heraclitus and Pythagoras and was continued in later centuries by philosophers including Spinoza, Hegel, Descartes, and Leibnitz. On the question of what is real, a divergence has always remained between materialism and idealism: Does reality abide in matter or spirit? In the absence of modern scientific concepts I was unable to come upon anything in classical inquiries I could relate directly to the creation of particles*. But as you will see, the Metaparticle Theory does provide new evidence that reality includes both matter and spirit. To be more precise, it deals with matter as a fundamental reality, created from the substratum's substantive aspect by natural laws, and differing from its conscient aspect, for ages called spirit, only in quality of energy and consciousness. In a short but incisive book comparing Western with Eastern religions, the Christian humanitarian Albert Schweitzer concluded that while West surpassed East in the teaching and practice of ethics, East surpassed West in the extent and depth of its metaphysics. This influenced me to enter the multi-currented seas of Eastern mysticism, yoga, Zen, and doctrinal writings. The voyage was far from wasted, but as for gaining a useful insight into cosmogenesis I learned most about "nothingness". Both Vedantic and Zen literature led me at length to understand why nothingness or "voidness", as in satori and samadhi, a seemingly infinite field of emptiness is beheld, but comes to be known as complete fullness. Later I discovered the explanation for this lies in the concept of field homogeneity. Another of the major clues sustaining my efforts stemmed from the Brahmanic term mulaprakriti, meaning root-matter. This source proclaimed, without elaboration, that materiality is composed of two ingredients held firmly in an enduring relationship, without which neither could remain in existence; and that these two, termed "spirit and matter", are actually two poles of the same eternal substance. In the historical literature of Western mysticism I found a very interesting and reassuring account. The medieval German ecclesiastic Meister Eckhart recorded in detail from his inner experiences the same phenomenon I had noticed in Eastern sources: "voidness". A relatively few explorers of consciousness in the West have referred to this experience as "the zero state", "Space consciousness", etc., but Eckhart termed it "the Godhead". He emphatically distinguished this sense of a shining emptiness from the "awareness of God", though his consciousness spontaneously alternated between the two states. According to him, "God has all the glory", while "the Godhead seems as empty as though it were not." Such East-West coincidences, as the dubious would surely call them, were further reinforced in the writings of my own mentor, Franklin Merrell-Wolff**, now departed. His term for that state of consciousness (which unlike Eckhart he preferred over the highest ecstasy and bliss) was "the High Indifference." It took me, incidentally, quite a long time to recognize an important hidden meaning in the latter word. It was also in a book published in the West that I came upon another brief but cogent clue which I could not have done without. It appears in the first volume of The Secret Doctrine by H. P. Blavatsky. It says in essence that the three main characteristics of "the Absolute" are abstract space, duration, and motion. *See important addendum dated Feb.'03 at end of Data Notes. No doubt semanticists can distinguish between being and existence, though Webster's Unabridged Dictionary does not. Yet the difference becomes indirectly apparent when the Latin origin existere is given as meaning "stand forth." The distinction is indispensable to this exposition, because its entire process depends upon the fact that existence is not the same as Being. (I capitalize the word to get away from worldly usages.) Being, in its cosmic sense, remains hidden. Existence "stands out" to be objectively knowable. A dimensionless point, a "field" of such points, and space itself could be shown to be the same, I believe-if there were motive enough for the argument. What is essential to this theory, however, is the concept of a Dynamic Field, "composed of identical points," "filled with the same intensity of energy," and "occupying abstract space." I should call your attention to the fact that all the words within quotation marks above are inappropriate to the very idea I am trying to get across; namely, a field of pure Being which underlies our universe of existing things. Our words are perforce "existence words"; we don't have many "Being words" (though the Sanskrit language did). There can hardly be a more abstract subject than the Dynamic Field, also known by other names such as Parabrahm, the Godhead, the High Indifference, the Absolute. We shrink from the abstract, the non-material, because we are immersed in materiality and a large part of the human race believe that is where all of reality resides. But there have still been many who have penetrated in consciousness to a sort of cosmic reflection of the Dynamic Field, and those who could say anything at all about it have said it was maximally real. So let's adopt both viewpoints for a moment and see if the word homogeneous can do double duty here. We know what it means: all of it the same; uniform throughout. That's the existence meaning. But it's also the Being meaning. The Dynamic Field should not be thought of as encompassing all the aspects of metaphysical reality. It is beyond the objective universe, but as will be indicated by the physical results of this theory, the Dynamic Field provides the basic materials and energies of the universe. Consequently, in metaphysical thought of both East and West, it holds a cardinal position which corresponds to omnipresence in trinitary systems. Where it is said to be characterized by duration, motion, and "abstract space", I found the latter term to be completely beyond my understanding until I realized it was another way of saying space minus the concept of dimensions. Having said all I think might be faintly helpful towards understanding the Dynamic Field concept, in general, I will go on now to what "occupies" the Field, or perhaps better "constitutes" the Field: the essence of motion. But let me say at this point that I do not know that everything I am writing about the "substratum" of the universe (or maybe "overstratum") is perfectly true and accurate. I seriously doubt that it could be, since I don't think anybody who is constrained within the limits of what we call normal human consciousness could actually know whether or not the Premise of this Metaparticle Theory accurately represents primordial facts. So I present all this as probably true-as far as I know-but with the expectation that what emerges (after the seven steps of particle creation) will underscore that probability. About three hundred years ago the French philosopher and mathematician Rene' Descartes declared that motion is the essence and cause of existence. Though several others have espoused the same general idea, it has not to my knowledge significantly influenced modern science. Among physicists an unreadiness to embrace motion as prime cause would seem to follow naturally from the fact that nobody (and I really mean nobody) can define just what is moving! My friend the British philosopher Ernest Wood wrote, in one of his many theosophical books, his definition of a perfect motion. He said a perfect motion would move in every direction, simultaneously and at infinite velocity, returning to its point of origin in no time. The result would seem to be identical to the "dynamic stillness" spoken of by the German-Tibetan lama Anagarika Govinda. Perhaps the two taken together can give us some impression of the absolute motion of the Dynamic Field. It may be pertinent, in view of recent (2001) news coverage of experiments at temperatures nearing absolute zero, to recall that although molecules can be stilled, atomic and particle motions continue. Given the non-dimensional nature of the Field, we can see that the modes of motion we are familiar with would be impossible there. No velocity, no expansion or contraction, no changing of position, no vibration. Yet energy has to be intimately associated with the homogeneous motion of the Field. And also imperative is the ability of innate laws and their forces to cause changes in the Field-without which nothing would ever happen! Now I would say it's close to impossible (for me, at any rate) to imagine a motion that doesn't move in any way or direction. Furthermore, increase or decrease in motion is wedded in our minds to velocity - which is likewise ruled out. What is left? Well, the energy "intimately associated with motion." We can imagine a change in energy that does not involve spatial dimensions. The single example that qualifies, I believe, is intensity. As we shall see, that concept will work. If there can be a change in the Field's eternal background motion at a point or at countless points, such change can only be one of intensity. Although quantity of energy may seem to be only an "existence concept," it is certainly legitimate to associate energy quantity with its intensity without bringing in ideas of volume in spatial terms. Consequently we can deal with "more energy" and "less energy"-always in relation to the Field's background (which remains forever indeterminable). We can confidently refer to the metaphysical energy-of-motion as dynamic intensity. And we know balance is essential. The Laws of Conservation and Equilibrium are both metaphysical and natural laws. They clearly apply in this theory. There is an even more basic metaphysical law for which I have never encountered a recognizable name. This hypothetically supreme law stems from the fact of ultimate non-dual Unity. It operates as a cohesive "unifying force" that underlies but is not the same as electromagnetism. As it applies to the seven-step, being-to-existence transition, this is the force which would cause paired points of different intensities to reunite if a separating force were withdrawn. In light of recent views expressed in particle physics literature, one could speculate that the physical force of gravity may be an extenuated, weakened effect of this unifying force, and also that the strong nuclear force may closely correspond to it. Before the listing that follows, may I ask you to bear one thing in mind. Through the years of this theory's development, my goal was to put together logical reasons showing that a viable physical particle could be produced out of a non-material, non-relative, permanent Field in only one way. I expected that way would be simpler, more reasonable, and would explain more than any other. Therefore the future electron's two points of difference, even though metaphysically balanced, must enter existence in company with a force keeping them together and another force to keep them apart - as outlined in the seven Steps. I hope I have been able to show in the above that the major developmental factors followed in the creation of particles, from a reality thought a few years ago to be "nothing",*** have been dictated by logical necessity. * Divergent balance is a principle lying at the very root of the Metaparticle Theory. In my justification of it in Discussions, it will become evident why, for the sake of quicker grasp of the basic creative divergence, I have begun with two points in the Field rather than with the concept of one point which becomes polarized to become two. ** The accepted rule that electrons and other particles always have twins of opposite electric charge, such as electrons and positrons, is not to be confused with the pairs of balanced, dynamic points composing each particle itself. With Metaparticles as of now well introduced, I find I must add a paragraph here. It deserved a prominent place on the first page of Data Notes, but in my earlier researches I simply never encountered any reference to it. Attributed to Anaximander, a Greek philosopher of the 6th century B.C., the concept is very pertinent to metaparticle principles. Anaximander, a student of Thales, described a basic, primordial "element" that differed from "all the heavens and worlds" created from "its infinite nature". He said this apeiron was an "eternal and ageless substance" encompassing all worlds, to which its "infinite motion" gave birth. This compares so closely to the Dynamic Field premise of the Metaparticle Theory that I feel somehow guilty for not knowing about it years ago. But I guess one can't read everything, especially without an Internet. When the binary structure of particles is shown to correct the insufficiencies of wave/particle concepts from the recent past, long-lived mysteries begin to disappear. Super-efficient math based on quantum and probability theory answered problems and allowed correct predictions before a more accurate understanding of particle structure had arrived. Quantum mechanics provided results, but in many cases no understanding of cause. Particle Physics and Cosmology are near the point of revealing new theories and perhaps new principles. These steps will allow conceptual understanding to overtake pragmatic efficiency and promote progress. Metaparticles has sought to make its contributions from beyond the city walls of science. There may be facets of each which reflect each other. Pure thallous chloride on a Vinylec (Polyvinyl Formal) substrate mounted on a 200 mesh copper grid. Produces sharp lines for accurate determination of lattice spacings ("d" values) for use as an electron diffraction calibration standard. 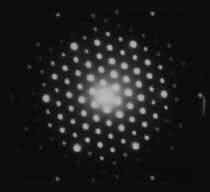 A typical electron diffraction pattern for a crystalline specimen is shown here. Transmission electron diffraction is highly sensitive to surface structures which consist of only a few layers of atoms. Shown here are the intensities from the Ge(111)4x4-Ag surface reconstruction recorded on a film negative with an exposure time of just 16 seconds.